Thinking about having an estate sale? Here’s a very enlightening article from the Wall Street Journal on how to plan the sale and choose a professional estate seller. If you are in a bit of a hurry, the article suggests you might consider hiring a liquidator who will offer you a flat fee to buy everything and clear the house completely. The liquidation business is driven by the four d’s: downsizing, death, divorce and debt. With about 10,000 Americans turning 65 each day, boomers account for many of the downsizers. But plenty of other people can find themselves in need of help dumping property — whether they are struggling to fit recently inherited antiques into a tiny apartment, liquidating assets as part of a divorce settlement, staving off creditors, or simply moving across country for a new job. And since the average American home spans some 2,500 square feet (not counting the storage lockers rented by one in 10 U.S. households), emptying one out isn’t easily accomplished alone.Enter the estate liquidator. There are roughly 14,000 estate liquidators in the country, according to Julie Hall, an appraiser and estate expert in Charlotte, N.C., and the executive director of the American Society of Estate Liquidators. Members of that organization must meet certain education or experience requirements and abide by a code of ethics. But most liquidators have no formal training, Hall says. Anyone can set up shop as an estate seller, and plenty of folks who lost their jobs in the recession did just that, she notes. 2. “Your stuff is worth a fraction of what you imagine. ”Television programs like “Antiques Roadshow” have trained people to think that many basements and attics contain valuable treasures. In reality, they don’t. Those Hummel figurines that grandma so lovingly collected? They’re not worth much these days, experts say, the result of changing tastes and a saturation of the market. At the height of their popularity, Hummels sold for between $100 and $450, but today all but the most coveted examples might sell for just $20 or $30. The furniture market has more potential sellers than buyers, too, and downsizing boomers are often appalled that their classic, sturdy pieces fetch a fraction of what they paid for them. For items sold at estate sales, the estate liquidators usually set the prices, but most of them are not trained appraisers. That’s fine, as long as they know to call in reinforcements when they’re in over their heads. When liquidators don’t know the value of an item, they should consult a trained professional, rather than, say, doing some cursory research on eBay. Ideally, consumers should get items of perceived value appraised before hiring an estate liquidator, experts advise. (A good liquidator will refer clients to an appraiser for hard-to-price items, but don’t count on it, Zeman says. )If an item is truly worth something—think authentic Cartier or Tiffany—then it might be best to sell it at auction instead of at an estate sale. 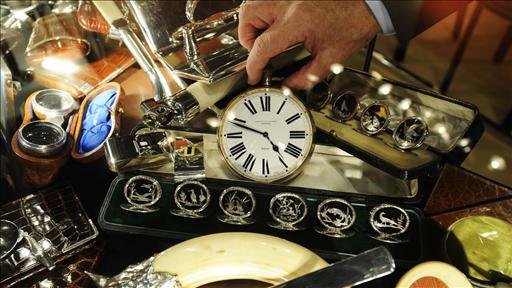 Estate-sale treasure hunters may appreciate it when liquidators undervalue an item, but the estate’s owners or their representatives typically want fair market value, and auction houses will likely do a better job of ensuring that they get it for rare items, appraisers say. Hoarding was recently recognized as an official disorder, with the condition’s inclusion in the American Psychiatric Association’s just-released fifth edition of its handbook of diagnoses, the DSM-5. (See: 15 new mental illnesses in the DSM-5.) Hoarding, distinct from even the most enthusiastic collecting, is characterized by the acquisition of dangerous clutter that takes over active living areas like beds and bathtubs. While it’s not that common for a liquidator to encounter a clinical case, many clients push the accumulation envelope, experts say. “You’d be surprised at how many people walk the line between collecting and clutter and hoarding,” says Chris Seman, president of Caring Transitions, a nationwide senior relocation and estate liquidation firm. Furthermore, seniors who survived the Great Depression are often loath to part with the most mundane of items, while those with cognitive decline often lose track of how many like items they have. Seman recently saw a cache of ice cream scoopers in the home of an Arizona couple in their 90s, for example. Alan Klug, a franchise partner in Baltimore and Pittsburgh with junk-removal service 1-800-GOT-JUNK, adds that people routinely underestimate what it will take to empty out their homes. “People think they have enough for a half-truck and it’s usually two trucks,” says Klug, whose truckloads are each 15 cubic yards, about the size of eight full-size refrigerators.Folks should begin the decumulation process before there’s any need for an estate sale, experts advise, shredding unneeded financial documents and giving away possessions when they’re still healthy and able to do so. This way, items can be thoughtfully given away, donated or disposed of before the time crunch that often accompanies a liquidation. While it’s hard to part with sentimental items like an old baptism gown, for example, families can take steps to ease the process: Seman suggests, for instance, that a downsizing boomer could invite friends and family over to tell stories about favorite items. Taking photos of accumulated treasures for an album can also help people goodbye-bye to them. “The memory isn’t in the clothes,” Seman says. “It’s in the situation.” See also: Estate planning for the rest of us. Don’t forget the taxman when considering an estate sale of a deceased person’s possessions. The value of all household items counts toward the total value of the estate for estate tax purposes (and if the estate sale is held soon after the death, then the value of the items is the amount they sell for at the sale, rather than just the appraised value, attorneys say). The federal gift- and estate-tax exclusion amount for estates of people who die in 2013 is $5.25 million, and the vast majority of estates fall under that threshold and owe no federal taxes. However, some states, including Massachusetts, have $1 million exemptions for state estate taxes, a limit that ensnares middle class households. A liquidator can give a client an estimate of the value of all household goods before the estate sale. Those who try to exclude household goods from their estate’s value can’t then claim a charitable deduction if they give away items left unsold after the estate sale, says Hyman Darling, a partner in Bacon Wilson, a law firm in Springfield, Mass., and a board member of the National Academy of Elder Law Attorneys. See also: Online auctions: Don’t get bitten when you bid. Copyright © 2014 MarketWatch, Inc. All rights reserved.